Link to our thread on Marvel's Netflix shows. Links to our threads on the 2003 film and the abandoned reboot. We don't seem to have a thread on Elektra (2005). As usual with Netflix shows, the production values appear to be decent. I probably won't bother with Daredevil. I'm trying to wean myself off of franchise fare in general. This is a losing battle of sorts, since I am, at heart, something of a fanboy, but I can certainly do without Marvel's anemic products. I wrote about "Daredevil" and other screen "guardian devil" heroes in connection with Catholic identity and Catholic guilt a month or so ago. The fact that the trailer opens with Matt in confession suggests the Netflix series may continue this theme. 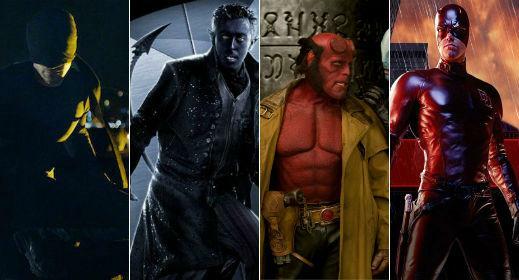 The paradoxical notion of a religious devil, or even a religious man dressed as a devil, seeking to work out his salvation while perhaps fearing himself damned, is a key factor in the appeal of these devilish heroes. On some level it represents the moral struggle and the experience of moral dichotomy in the starkest possible terms. I watched the first two episodes last night. It's a bit early to say it's good, but it ain't bad. Well, except for the fact that the visuals are way too dark, at least on my television. Sometimes it's really difficult to see what's going on, and that's a detriment. EDIT: FWIW, I like Daredevil a good deal more than most of the MCU stuff I've seen. In some ways, the show benefits from the Netflix treatment, since it's forced to focus on smaller scale conflicts and incorporate some tricks (like the fake one-shot scene at the end of the second episode) to conceal the more limited budget. Plus, character moments are given the chance to expand rather than being shoehorned in between action sequences. Daredevil grew on me, but I most probably would not have continued watching if not on Netflix, where I could skip through bits. The overall story arc lacked drama. The hook in these cases tends to revolve around hero/antihero/villain idiosyncrasies - but the characters in Daredevil just aren't that interesting. The pseudo lawyer drama also grew thin in a hurry. There were a few pretty good shots/sequences, but nothing that wasn't flat out cribbed from other action franchises. I wouldn't rate this any differently than The Flash. This quick Vulture review/editorial is spot on. Netflix has not proven a reliable producer of TV-like content, as most of their shows have been either mediocre or outright flops. Compared to Amazon's pilots, Netflix just seems to lack creative talent. Bojack Horseman and House of Cards are notable exceptions, though the latter has grown clumsy. It would make sense to me that Netflix is content to dribble out mediocre content on par with network dramas and comedies to maintain interest in subscriptions. I'm a little surprised there hasn't been more discussion of this here. I finished Daredevil. There are a hundred reviews and criticisms and spoilers out there. You can engage in them as you will. I was struck by one thing I haven't seen written about anywhere so far. Matt Murdoch/Daredevil's need for spiritual/philosophical guidance compared and contrasted to Wilson Fisk/The Kingpin's need for the same. Murdoch was guided by his father and the priest he visits. Fisk by his father and Madame Gau. Murdoch asks, "Is it right to kill one man to save thousands?" Fisk asks, "Is it right to kill thousands for an ideal?" Murdoch is told he must choose. Fisk is told the choice will shape him. I'm not sure I've ever felt so empathetic to a villain before. Certainly not in the current wave of superhero genre pieces. I felt sympathetic toward Wilson Fisk. I... liked him. He could be brutal, stoic, passionate. He wanted human contact. He had been damaged, like we all are. He was told by someone he respected, he will become what fate makes of him. And at the end, he stopped fighting against that "destiny." He embraced it. Murdoch was almost less sympathetic. He wanted to take action - black vs. white. It was palpable. But, unlike most depictions of clergy in TV and film, his spiritual advisor refused to make proclamations, instead inviting him to have a latte. Also notable, the priest waited for Murdoch to come to him, and walked away not knowing what Murdoch would do. Gau came to Fisk in each instance, and pushed him in a certain direction. The tragedy there was Fisk had people surrounding him who wouldn't push him, but trusted him - from his mother to his assistant to his newfound girlfriend. The final confrontation was a disappointment - some people seem to hate the Daredevil costume - I was disappointed that it came down to merely fisticuffs after the rather exceptional setup. Here's a clip from The Best TV Shows That Never Were dealing with a previous attempt to bring Daredevil to the small screen. It's short, but there's some footage, anyway. After two seasons, Netflix’s Daredevil has earned its right as the cornerstone of Marvel’s “street level” response and the parallel team-up to its cinematic Avengers, The Defenders (which will comprise Daredevil, Jessica Jones, Luke Cage and Iron Fist). This is somewhat surprising, given that Daredevil is a B-list superhero with not much visibility beyond a failed tent-pole film experiment. Be that as it may, the series has generated so much public goodwill and critical praise that it’s hard to conceptualize the television extension of the Marvel Cinematic Universe (MCU) without it. In one sense, though, Daredevil’s success was always unlikely; even the superhero’s original conception was an afterthought. Back in 1964, the year of Daredevil’s debut at Marvel comics, Stan Lee was immersed in developing the much more lucrative and popular heroes like the X-Men, Spider-Man, and even the Avengers when he initiated the character’s creation in what was essentially a Spider-Man rip-off — a regular man become super-human through a radioactive accident who swings through the city fighting crime. The difference, though, between Peter Parker/Spider-Man and Matt Murdock/Daredevil was primarily that the accident that created Murdock not only blessed him with super-human powers, but also handicapped him: While Peter Parker gained the powers of a spider by being bitten by a radioactive arachnid, Matt Murdock lost a basic sense: his sight. Along with the addition of a superhuman “radar sense,” this allowed his other senses to become enhanced — primarily, his hearing and ability to listen in new ways. Daredevil is thus unique among most popular superheroes — and especially the current wave of film and television meta-human stars — in that his superpower doesn’t merely elevate his physical abilities above the average human’s. Instead, his power simply equalizes his disability to give him a level playing field. But it’s not just Murdock’s ability to hear that defines him; it’s also his readiness and willingness to truly listen. This is what gives him the edge and makes him truly super.